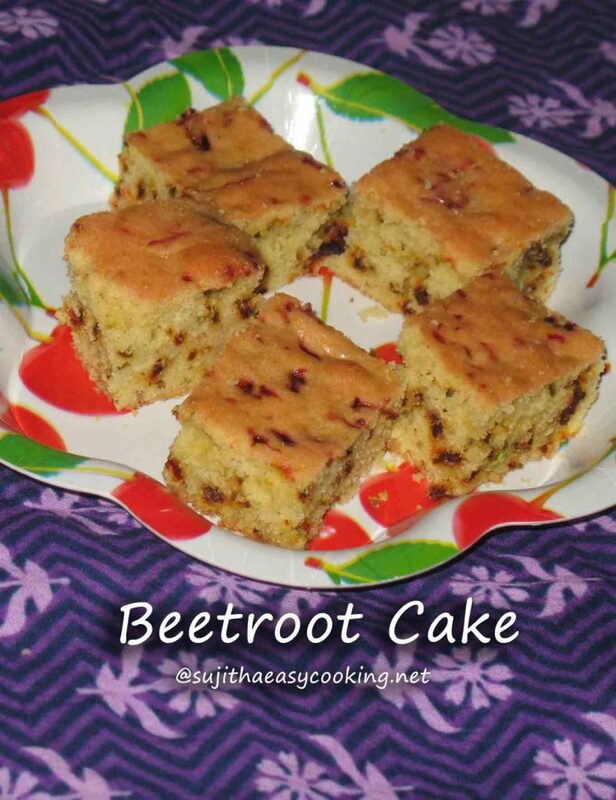 Beetroot in cake… Its new to me..when Goggling for cakes i found the carrot cake… had a thought why dont we try the healthy beetroot cake..
* Beat the Egg till it raise the foam.. add in the butter. * Sieve the flour, Baking Soda, Baking Powder and set aside. * Add the sieved mix and gently mix them without any clumps. * Add the Beetroot to the batter..
* Put in a Preheated oven and bake it for 25 mins @ 180C. An interesting use of Beetroot 🙂 Would love to try this one out. Beet cake ! Wow …looks superb !! Beetroot cake looks delicious love it. Very delicious and love the beetroot pieces there, looks superb.. This is new to me….Loved the idea…..Thanks for linking this flavorsome recipe at my event..looking forward for many more…. must appreciate your patience..such a beautiful pics….great luking cake..